The films of Danny Boyle have largely been subject to diminishing returns as his career has progressed and he's continually amped up his hyperactive, fragmented visual style. It's quite a breath of fresh air then to return to his debut feature, Shallow Grave, also the first film from screenwriter John Hodge and producer Andrew Macdonald, who would go on to make Trainspotting with Boyle next. Shallow Grave anticipates Boyle's frenetic stylistic flourishes occasionally — most visible in its aggressive, confrontational tracking shots — and its theme of friendship corrupted by money is a familiar Boyle trait, but it's a simpler, more satisfying film. The narrative is stripped to the bone and the film's macabre sense of humor is perfectly pitched — the excesses of future Boyle films like 127 Hours and A Life Less Ordinary nowhere to be seen. Boyle gets excellent performances from Ewan MacGregor as tabloid journalist Alex, Kerry Fox as doctor Juliet and Christopher Eccleston as accountant David, a trio of Edinburgh flatmates looking for a fourth roommate and putting all manner of hapless folks through a cruel audition process as the film opens. There's little likable about Alex's flippant disregard, Juliet's aloof indifference and David's suffocating self-loathing, and you won't warm up to any of them as the film progresses. After finally securing an acceptable fourth, the three soon discover he's overdosed in his room, and he's left a suitcase full of money just there for the taking. It's not long before they've smuggled the body to the forest, chopped off any identifying features and buried him. Drawing the short straw ensures David has to do the ghastly deed himself, which kicks off a terrifying transformation, and the money itself activates an ever-shifting power structure between the three friends — not exactly model citizens to begin with and now consumed with greed and paranoia as cops and drug dealers close in on all sides. Boyle does a nice job creating an increasingly suffocating atmosphere with the variety of sets used to create the posh loft where much of the film takes place. He doesn't shy away from tangible nastiness, whether in the cringe-inducing sound effects of a body being disassembled or the abject cruelty lobbed by the three main characters at one another, making Shallow Grave a distinctly unsettling experience. Criterion grants Shallow Grave a 1080p high definition transfer in its original 1.85:1 aspect ratio. The film looks consistently excellent throughout, with a sharp and very clean digital transfer that remains as detail-rich and stable in its shadowy scenes as it does in its daylight ones. Colors, especially a red motif that pops up here and there, are vibrant and true, and black levels don't crush during the darker moments. A thin layer of film grain is visible and unmarred, while damage is relegated to a few brief speckles. Audio consists of a 2.0 DTS-HD Master Audio soundtrack that's crystal clear and offers solid immersion of music and effects. A solid collection of behind-the-scenes material makes it into the extras, including a new video piece that features McGregor, Fox and Eccleston interviewed separately about their recollections of production, and two commentaries — a previously available one from Boyle and a new one from Macdonald and Hodge. Andrew Macdonald's brother Kevin directs a 1993 making-of about the film, and much of that footage comes from the Macdonald brothers' video diary (also included here in its entirety) from the 1992 Edinburgh Film Festival, where they're trying to gain financing for the film by attracting a big star, like Sean Connery. Also included is a trailer for the film and a teaser for Trainspotting that accompanied the first home video release of Shallow Grave. The package also includes an insert with an essay by critic Philip Kemp. 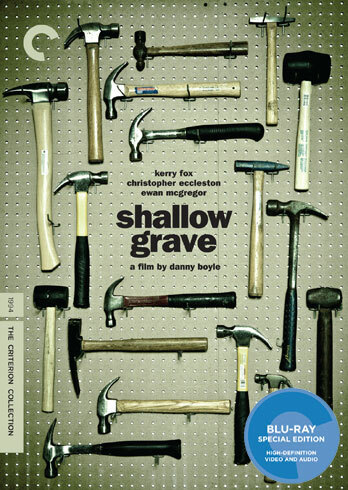 One of Danny Boyle's most satisfying films, Shallow Grave gets a nice special edition from Criterion.